I love the instant gratification of hats! 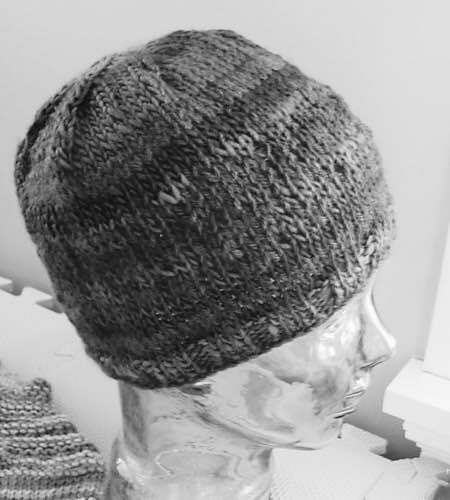 I haven’t knit a hat in 11…clearly it was time to start one! How do I know my colors will work though? I’ve definitely finished a striped project only to realize, I’m the only one who can see the design. I’m looking at you Skull Hat! If you look closely, because I’ve told you to, you find the skull and crossbones. Sadly, I was not trying to create a hat with secret hidden gang signs! I actually wanted my efforts to be visible. Turns out, technology has given us a great tool to check our results before we even begin! The black and white photo! Taking a black and white photo (or converting a color photo to black and white) shows us a colors true value (at least I think that’s the right term.) Same photo as above, I just converted it to black & white and viola! 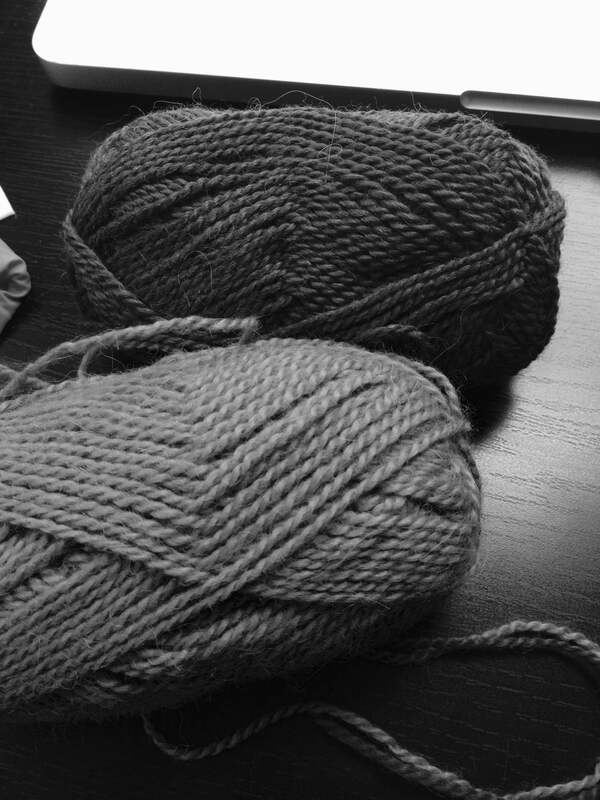 Our two yarns that appear similar in the color photo show us they have nice contrast in the black and white version! Success! Knit on! Meanwhile, the skull and crossbones clearly fail that test! D’oh! Live and learn! I always check my colors now! All hail the iphone! How did I ever knit without it? 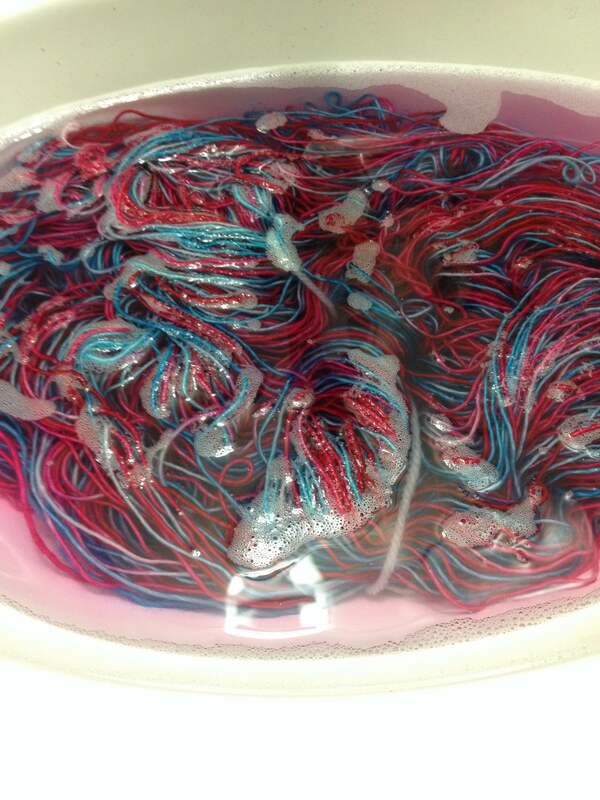 My Mom is a tie dyer, she dyed me some yarn and sent me home with a little bottle of stuff called Synthrapol. I promptly stored it under the bathroom sink and forgot about for 18 months! Another tie dye friend reminded me of it during last week’s incident. What the heck, why not try it on the second skein I had? Of course, this mean re-hanking it. With zero help from Rocky. As usual. 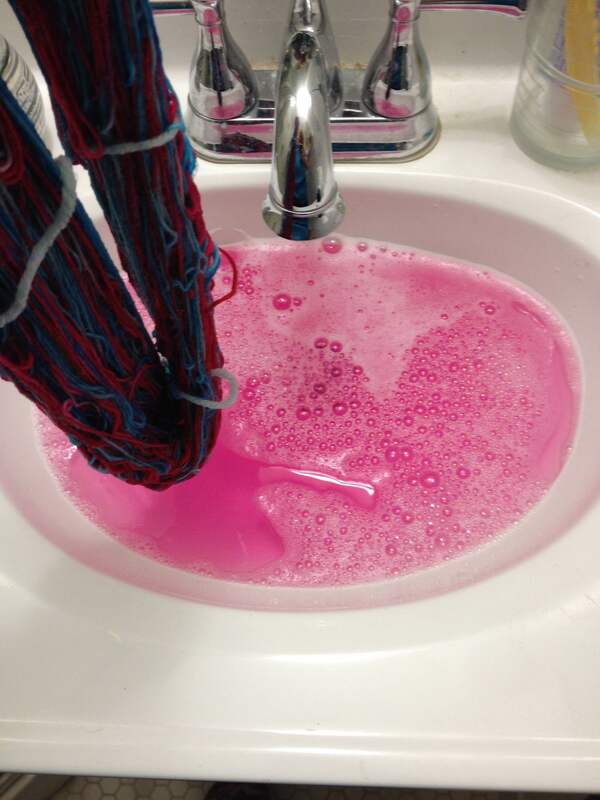 Mom assured me, even if the water turned pink, the magic detergent she gave me would prevent the dye from resetting onto my yarn. Tie dyers use it because keeping whites white is a big part of a successful tie dye so it should work for me too. I had no reason to distrust my Mother at this point, but I was still skeptical. After all, she’s the one who convinced me patchouli came from the musk gland of a raccoon. I can’t even tell you how many times I argued with people about that because my Mother told me so. She’s never told me crazy laundry stories though. So I just waited. The wash water did become quite pink! The photo doesn’t do it justice! 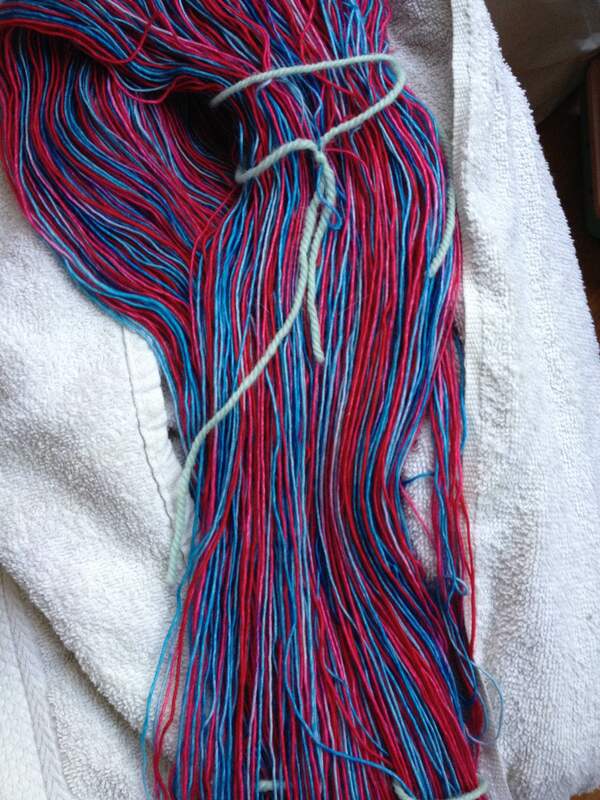 It was hard to tell while the yarn was still wet, if the Synthrapol had done it’s job. It was looking good though! 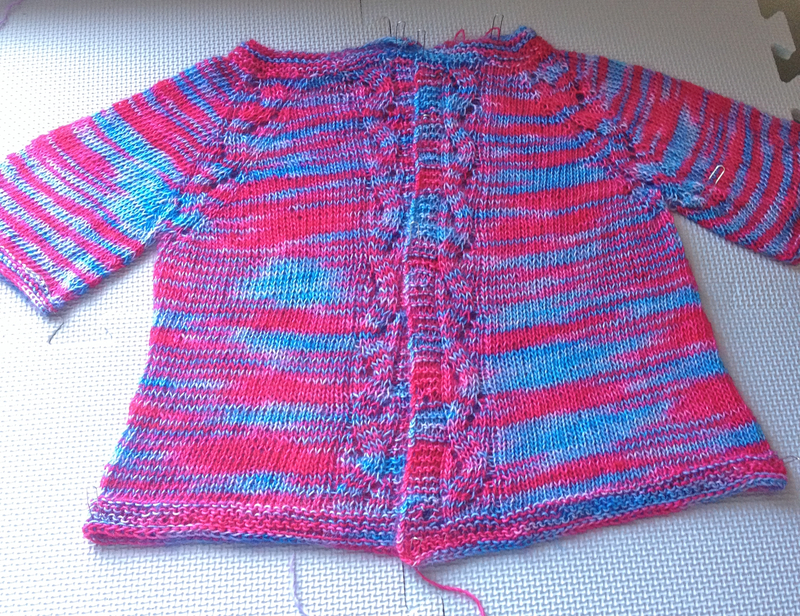 and here it is dry, along with the already knit sweater…vibrancy in tact!! Yay Synthrapol!! It’s much easier to tell in person of course and in reality, the difference is slight. They’re both still pink and blue. Yes, I am splitting a few hairs here. BUT…MadelineTosh is the type of luxury brand that shouldn’t have these issues so I’m boycotting them this week. One easy wash, with Synthrapol and no bleeding. 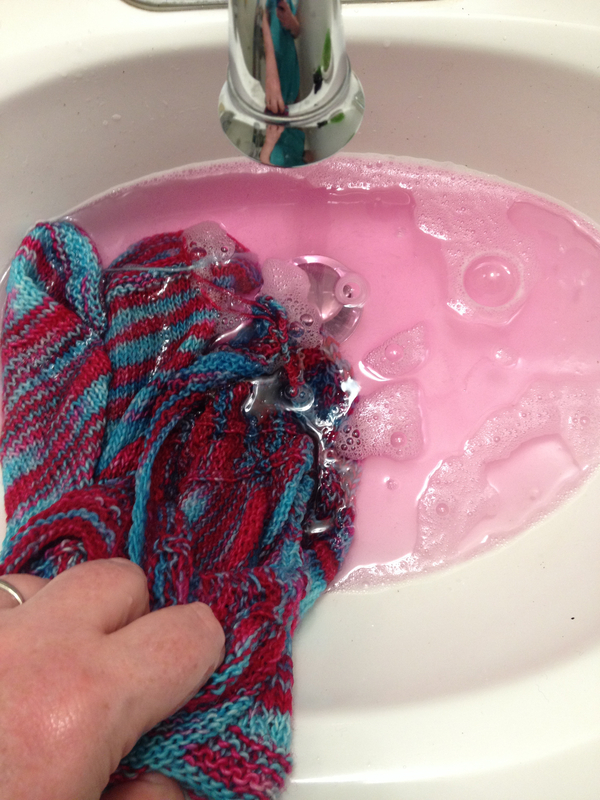 It’s a bit outrageous that dyers cut corners in their wash and rinse process when an easy solution exists. Once again, I’m pleased with myself! This little sweater is so stinkin’ cute I wish I was an auntie! A really super pattern! The spot I needed a bit of clarification was the sleeve divide. It’s worth noting that you divide for the sleeves in the middle of the lace sections. Of course, if I counted stitches I wouldn’t need that clarified! I’m less pleased with the yarn. I haven’t decided yet if it truly bled or if I was just rinsing excess dye away. It seems TML is the most likely Tosh to have dye issues. I should have seen it coming a mile away. Reds are troublemakers! Rather than soak and block, I rinsed briefly. My whites are a little pink and my blues are not as vibrant so I should probably face the facts: this yarn bleeds. BOO! The sweater isn’t ruined so in this case it’s no big deal. I’m just glad I didn’t do something silly like edge it with white trim. I’m thinking I’ll rehank the second skein I’ve got and give it a soak, either with Synthrapol to preserve the current colors or maybe just soak it and let it bleed, to get more purple from the second skein. I do like purple after all! I’m sure it’ll be a blog post eventually! 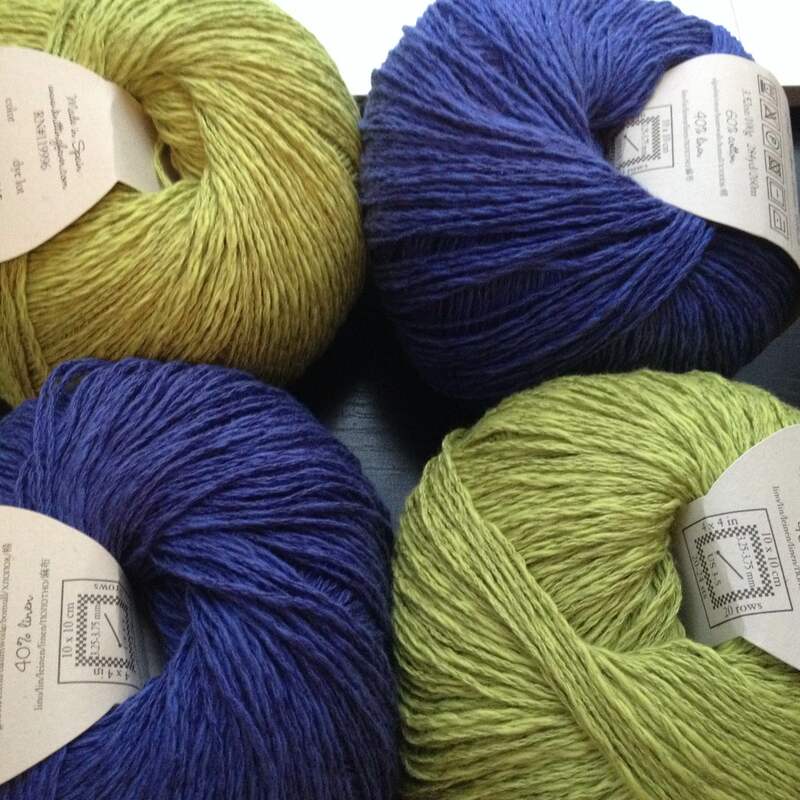 I’ve got ideas galore for the second skein! After a short break, my Batad is back on the go! 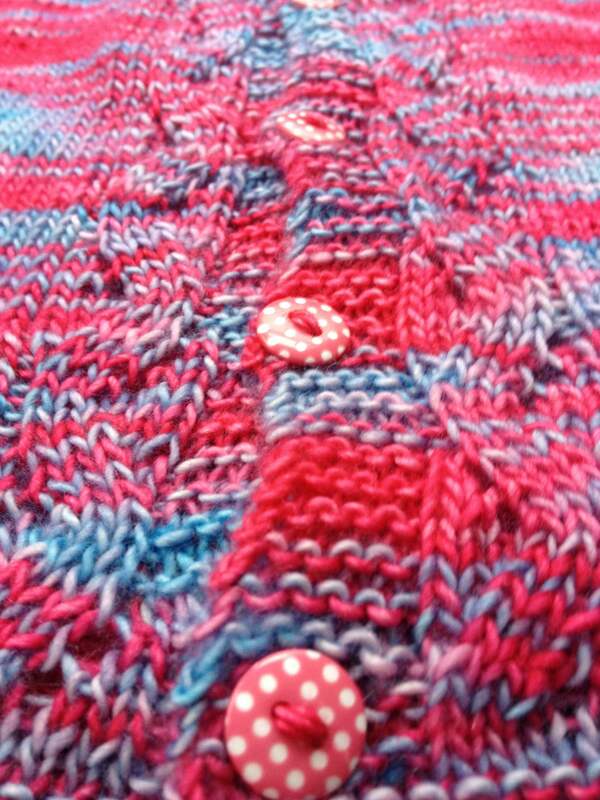 I really adore the simplicity of this design, it’s great travel knitting…until you get to the welt seam. Mostly I breeze through the short rows and the welt knitting and then it sits for a few days until I find time to do the one fiddly row. It’s a pain but the slippery linen-cotton blend I’m using, actually makes it less annoying. Zipping through the next section, I’m dreaming of knitting to come. I’ve got an FO for tomorrow, so what’s going to be next week’s FO? Probably not the Batad, but the Cassette Tape Vest could make it — Maybe. I should really start a hat, that could be done and I have tons of design ideas. I’m trying hard to keep my project count low–I’ve only got 8 right now! I could get so much done if I didn’t divide my time! I’m really thinking about the Superior Cashmere I brought home though, I want that cashmere cardigan!! 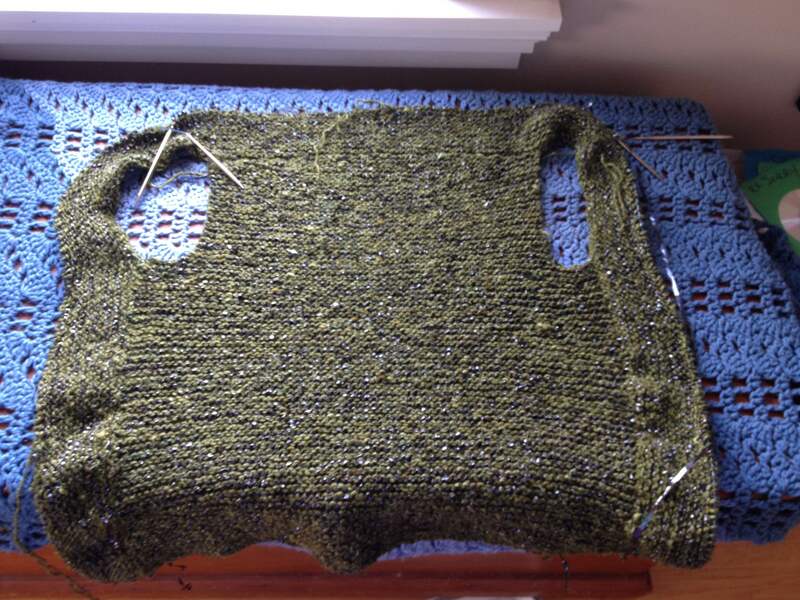 …one little swatch couldn’t hurt my progress too much, right? And so it goes…all day long, from one knitting daydream to the next! 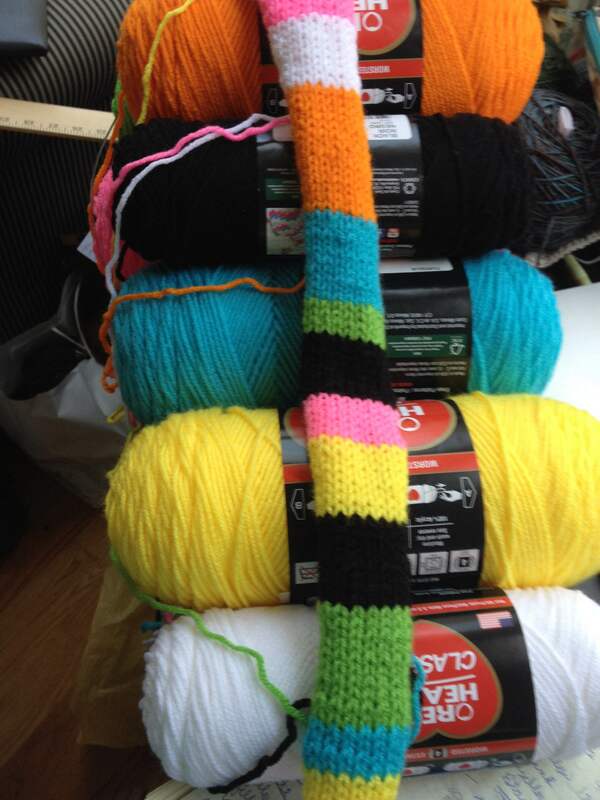 WIP Wednesday – Yarn Bombing! 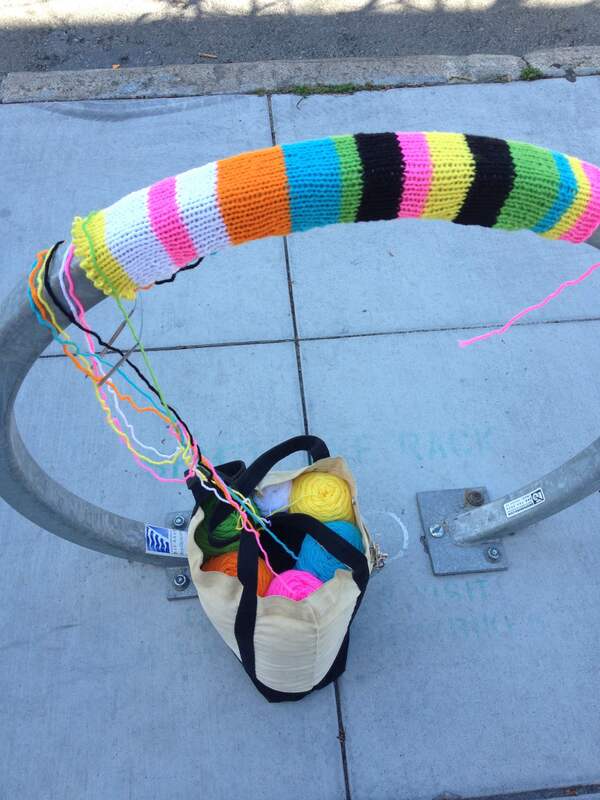 I’ve dabbled in yarn bombing before. After a bit of a break, I’m making a return! 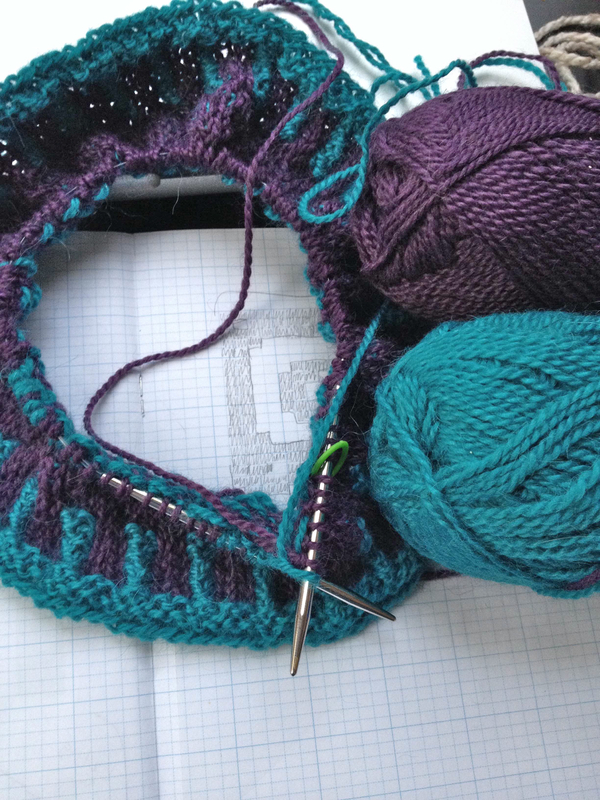 The idea is to keep the strands from tangling…center pull so the skeins don’t need to move and instead of knitting across, turning and purling back, I’m knitting across, not turning=no tangling, and then purling backwards across the row. Passing the stitches from right to left as they’re worked. So far, so good! I’m randomizing the width and color of the stripes by rolling dice! 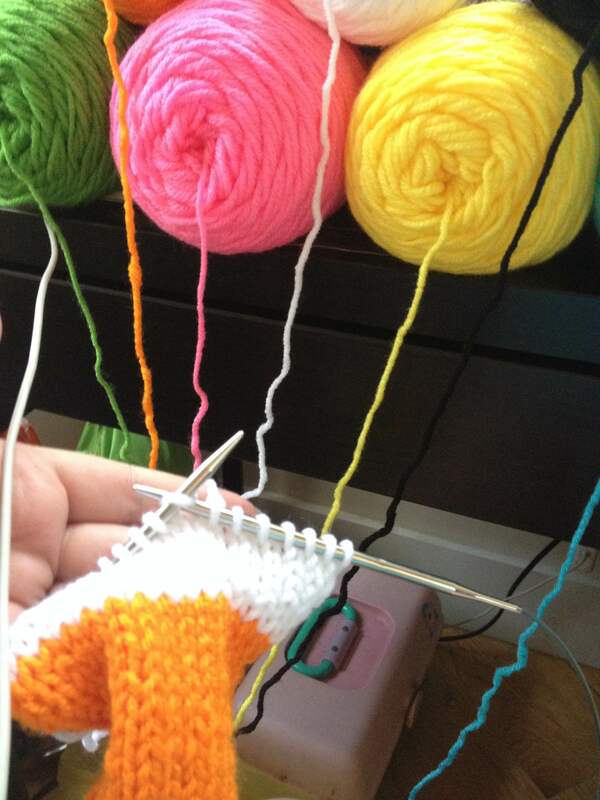 Knitting and game night all in one! Woot! I went out for a little test this morning…and it’s looking good. Yet another project I can’t wait to finish! Today is one of those days I really wish I was an octopus! Two arms just are not enough! I was just finishing the back piece when you saw it last. 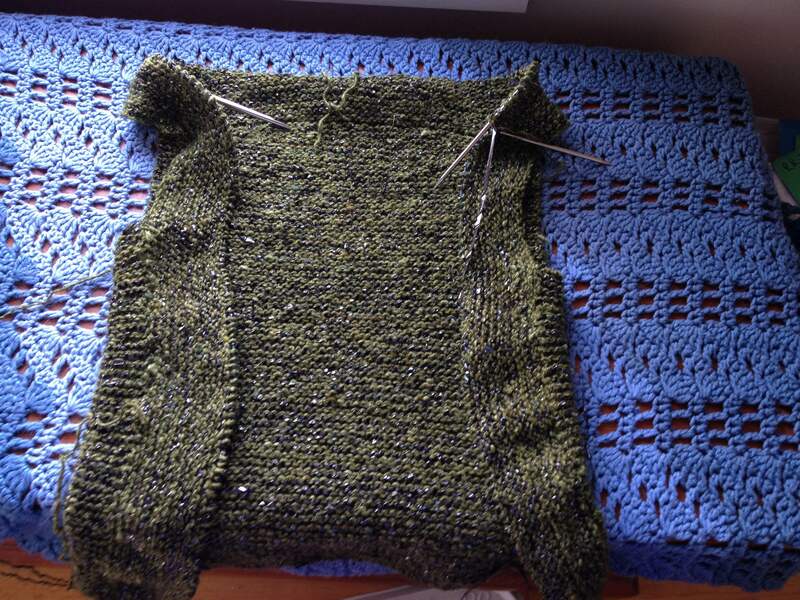 I’ve since picked up stitches up the side, across the back and down the other side and cast on stitches for armholes! I’ve worked few inches beyond the armholes…finally enough that I could try it on. Everything is on track! The length is good, the armholes are good! It’s slow going but I’m looking forward to getting it done…the finishing work is super minimal! Seamless is awesome! 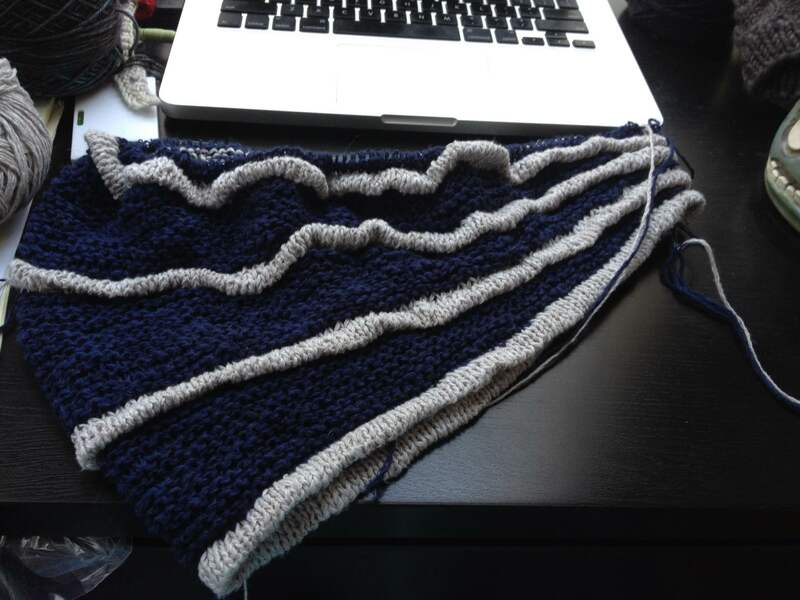 I’ve only got 85 more rows to go…all garter stitch! Process Knitter Powers Activate! I thought stash enhancement posts were perfect blog content…turns out, Cold Sheeping (aka going on a yarn diet) is not one of my special powers. 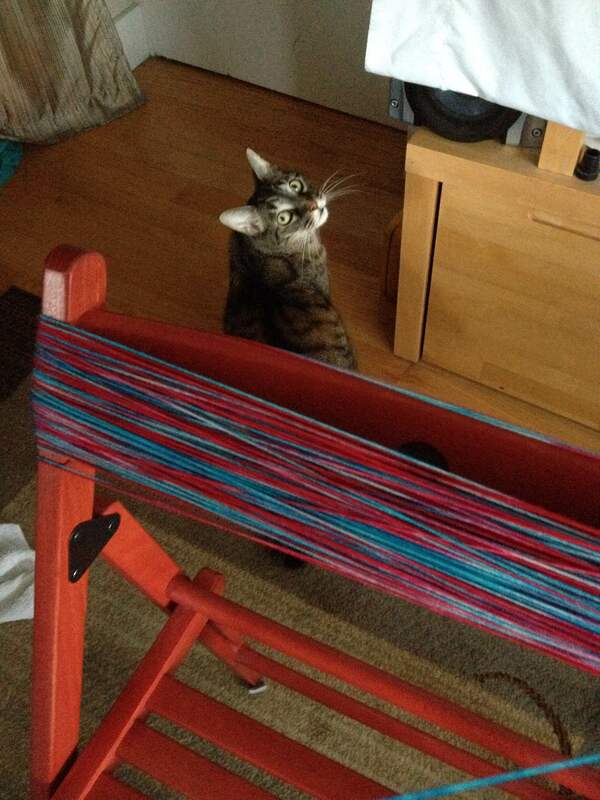 I add yarn to the stash so frequently, I’d never get any knitting posts in. So here’s a recap! 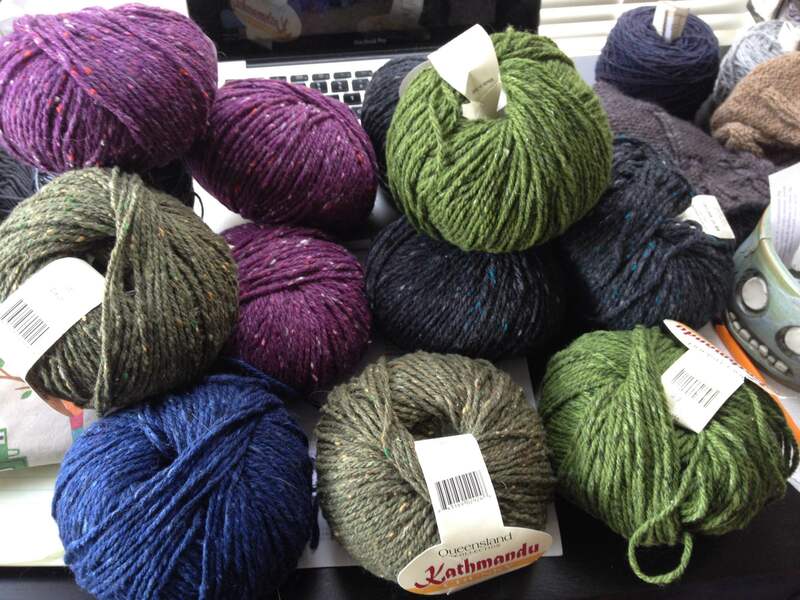 I’m pretty excited about all of these yarns! 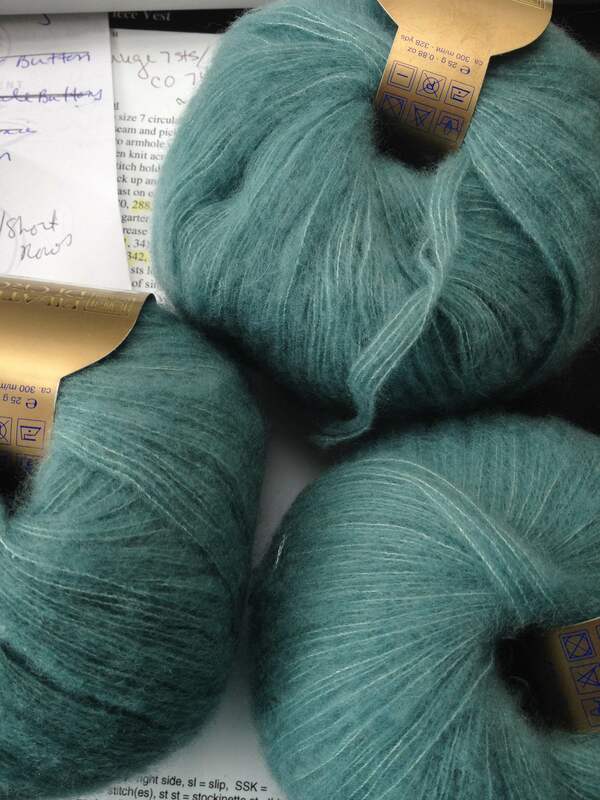 First up…I’m enjoying my Batad, loving the Juniper Moon Farms Zooey. It’s a 60/40 cotton-linen blend which is perfect for summer! Not sure what I’m going to do with it yet, it was an impulse acquisition…the green was a late arrival. I had to have it and it needed a friend so two purple guys came along too! I’m also pretty excited about my rainbow skirt so I’ve got another skirt planned! 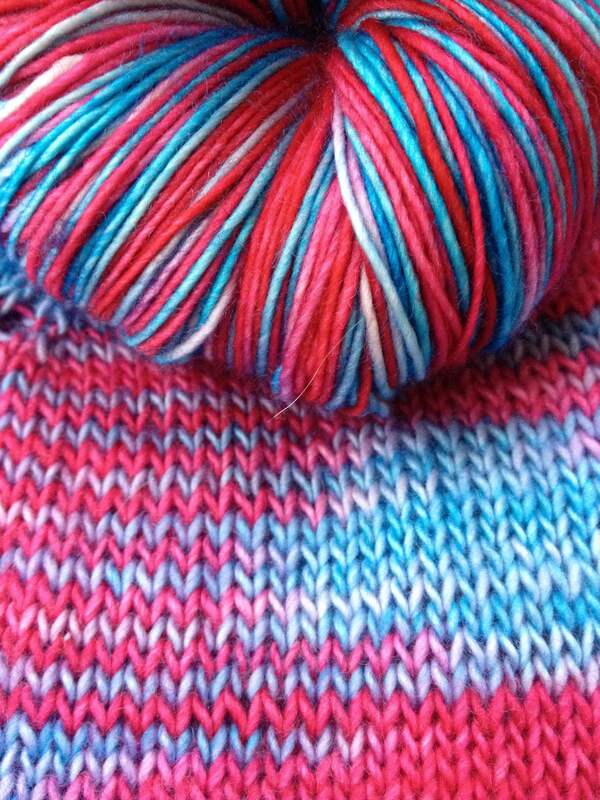 This time I’m thinking some gradient striping with a touch of feather and fan at the bottom. The yarn is Kathmandu Chunky because CASHMERE! This yarn is so amazing when it’s blocked. It’s sadly discontinued, so this was a bit of a knee jerk stash addition, I may not get to knitting it for a while but I’m happy it’s here! I’ve taken on a yarnbombing project. 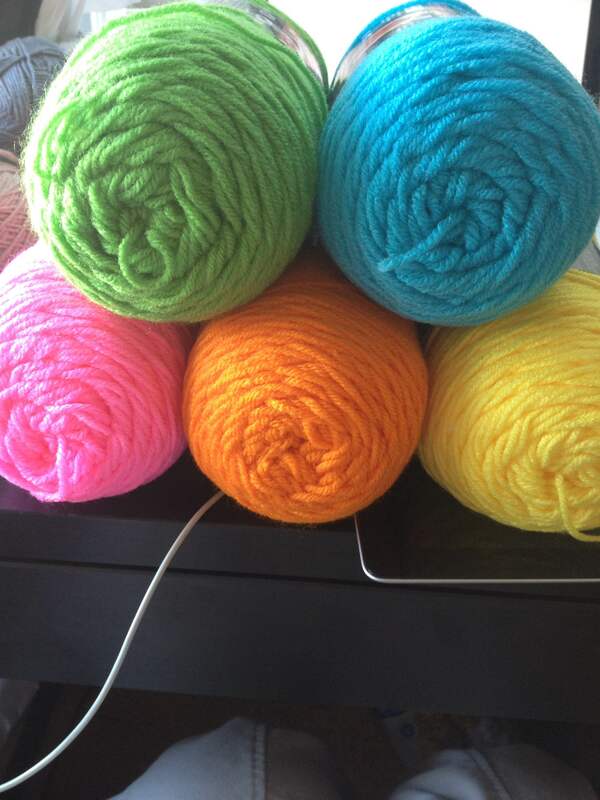 It’s in it’s infancy so you’ll have to wait on details but here’s the yarn! Red Heart Super Saver, an inexpensive, utilitarian yarn for this project. I do sort of love the colors. Last, and certainly, in no way, not least…Superior Cashmere! I love this stuff as a second strand to soften up other yarns but I’ve gotten hooked on the idea of knitting it single stranded on a large needle! 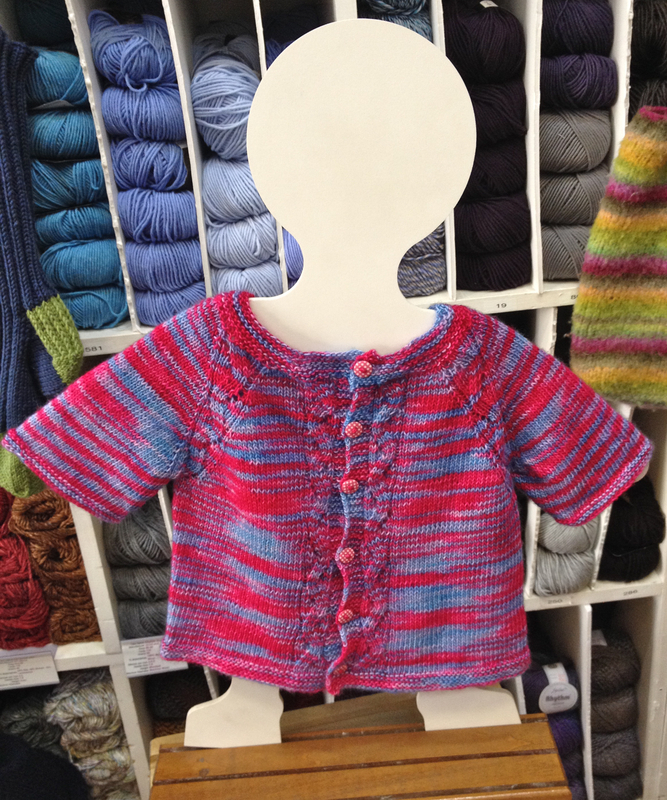 Enter Coco Knits’ Sabine…an amazing lightweight cashmere cardigan! A cardigan that can squish into a pocket!?! Sign me up! I’ve been dreaming of the swatches…this is going to happen soon, very soon!! Enough talking! Time to knit!